Trusted by over 1,000,000 smart travellers. Our customers are our best advertisement. This is what they say. We have been using Park and Fly now for a few years, ever since we had our son. It is a convenient service for families. We can have our luggage loaded in the car the night before, use our own car and child seat to park at the Park and Fly and they have a fantastic shuttle service for hassle free transfers to the airport. The service on the way home is just as good. There is no need to worry about whether a taxi will have a child seat and our son can sleep in his own child seat on the way home. The staff are friendly and helpful! I often travel interstate for work and cannot recommend Park & Fly enough! Conveniently located for parking, regular fast shuttles to the airport, and most importantly - service! The staff are always friendly and knowledgeable. I occasionally get my car washed while it's left waiting for me, such a treat to be able to collect a fresh clean car after a hectic airport experience. Thanks Park & Fly! Keep up the good work. We have been using Park & Fly over the last 2 years. Every time we know that we can leave our car in a safe place. The service is incredible. Always very prompt and hassle free when dropping or collecting the vehicle. Shuttle bus always ready , no waiting time. We do not even look around for other parking companies. Every time we fly out we use the service.Truly recommended. I use Park & Fly several times a month for business trips, the staff are very friendly and helpful, and the service is fast and efficient. I have never had an issue with my parked car, or getting dropped off and picked up at the terminal. The Park & Fly team are second to none when it comes to airport parking! Great work guys keep up the great work. It is the first time I have used airport parking and it is by far is the most convenient way I have ever been transported to the airport. The drop off was fast and I was at the airport terminal in no time. They even had car seats for the kids. There was no waiting at either end, we were in and out both on drop off and pick up in the most efficient manner. All of the staff that we encountered were particularly pleasant and willing to help. Overall, one of the best service experiences we've had for a long time. The staff that you have in your car wash and treatment section have done an outstanding job on my vehicle yesterday and I would like you to pass on my regards to a job well done. After arriving on a delayed flight we inadvertently left a package in your car park. Upon returning home some 1 and a 1/2 hours later, we realised our error and contacted your staff. Your employee immediately located the package and rang us back to advise we could collect it at the office the following day. While the package was not extremely valuable, we would like to take this opportunity to thank your employees for their honesty and helpfulness. We want to thank the staff at Park & Fly, Sydney Airport for their efficiency, honesty and kindness. We had left our camera and even more precious, invaluable, irreplaceable, photos in the pickup vehicle … the staff then followed through and tracked it down so by the time we returned to the parking station they had it ready to hand over to us. Last Wednesday when in Brisbane I discovered that my Daughter (who is a diabetic) had left a small bag containing important diabetic supplies in my car which was parked at your premises. I phoned Park and Fly who were extremely helpful. At my request he looked in my car and found the bag. He arrange for a taxi to deliver this to my daughter at her school. So quick, so helpful, as I have always found all Park & Fly staff, [add] cheerful and friendly into the bargain. I've been parking regularly here for a number of years now both for work and for holidays. I've always been impressed with the reliability of service, the availability of vans and the speed of transfer - there's never any waiting around even when I've needed the family van with 3 car seats! Thanks for the email and the assistance with the parking confirmation and great saving for this personal trip, more dollars to spend on golf in the US. Again it is greatly appreciated, Park & Fly have long been my choice for both short and long term parking, anytime I fly. Your company is leaps and bounds ahead of the competition. My sincerest thanks for your kind and generous offer to mail to me my folder, left stupidly by me, in your car park. The folder arrived and I am extremely grateful. Thoughtfulness by you and Park & Fly will surely see us return time and again when flying out of Sydney. How close is Park & Fly to Sydney Airport? 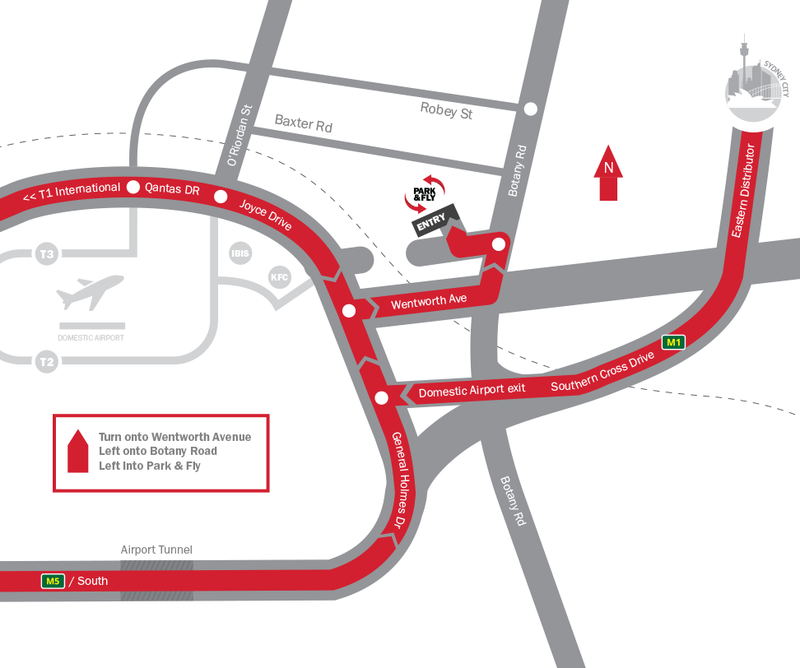 Park & Fly is very close to Sydney Airport. Located in Mascot, Park & Fly is just five minutes in our on demand shuttle bus to the domestic terminals and 12 minutes to the international terminal. Airline companies recommend at least an hour for domestic and 2 hours for international flights depending on the airline. Park & Fly advises all customers allow an additional 20 minutes for check-in at Park & Fly and drop off at the terminals (worst case scenario). This is advised to allow for unexpected traffic hold-ups or other unexpected delays. Does Park & Fly have a vehicle height restriction? Yes, Park & Fly can only accommodate vehicles 2 metres or less in height in our undercover carpark, including any aerials and / or roof racks. We do have an option for taller vehicles (please call our office line on 02 8335 4714 for details). How does Park & Fly determine my parking cost? Park & Fly determines the cost of your stay using a “Per Calendar Day” system. This means your total cost to park is calculated using the number of calendar days of your stay. As such, specific times of arrival and departure have no bearing on the price quoted. All Park & Fly booking and quick quote forms already follow this pricing structure. Please note that charges are based on calendar days and not a 24 hour period. If you need any further information please do not hesitate to contact us via our Contact Us Page. You don’t have to make a booking but it is recommended you reserve a spot at Park & Fly to avoid disappointment. Due to the demand for airport parking in Sydney, there are times when our carpark is full and only those with bookings will be able to park. If you arrive without a booking and we do have space, you will need to pay the drive-in rate, unless you are an existing Gold loyalty member. All bookings can be made through the website on the Book Now page. Pre-booking your parking will not only save you money but also time when checking-in and will ensure that you are familiar with our Terms & Conditions. For customers who do not have access to the Internet or need booking assistance, please Contact Us or call 02 8335 4714 from 9am to 5pm EST, Monday to Friday. Where is Park & Fly located? Park & Fly is situated at 1008 Botany Road, Mascot, NSW 2020, located on the corner of Botany Road and General Holmes Drive. Entry to Park & Fly is only available via General Holmes Drive. Find us using the map on Locate Us. Can children travel in the Park & Fly shuttles? If you do have a baby under 12 months and are travelling with two adults or more, the baby and one adult can be dropped at the airport and the vehicle can then be driven to Park & Fly and we can take the remaining passengers back to the airport in one of our on demand shuttles. I want to drop off my car but someone else will be picking it up. What do I do? You will need to make the booking under the person’s name who is picking up the vehicle. When you check the vehicle in you will be given a check-in ticket, take a photo of it and send it to the person picking up the vehicle. The person picking up the vehicle can then show the photo to the checkout staff. If you cannot send them a photo, the person picking up the vehicle must quote the rego and produce their driving licence. We cannot release a vehicle if the person picking it up is not on the booking and we haven’t been notified by email by the person who dropped the vehicle that someone else is picking it up. My Domestic flight leaves at 6am, so what time should I arrive at Park & Fly? Park & Fly opens at 5.00am and we are only minutes away from the Domestic Terminals. Many customers take the first domestic flights out of Sydney. If you prefer, you can get to us around 4.50am, then you will be one of the first to check-in when our doors open, as there is sometimes a queue at this time. I need to be at Park & Fly earlier than 5am for an international flight, do you open early sometimes? Park & Fly open at 5am and we are not able to operate earlier than this. On the occasion that you do need to be at the airport earlier than 5.30am then you would have to make alternative arrangements. Does Park & Fly offer valet airport parking? Can I just drop my car at reception? When parking undercover, simply park in a drop off bay on the right hand side, take out your luggage, lock your car and proceed to the check-in desk. Our check-in staff will take your keys and give you a check-in ticket and then one of our on demand shuttles will take you to your terminal and our staff will park your car for you. Are the Park & Fly transfers suitable for someone in a wheelchair? The Park & Fly on demand shuttles do not have the capacity to transfer wheelchair customers to and from airport terminals. Please alight such travellers at the airport terminal first prior to dropping your car off at Park & Fly. If you’re interested in joining one of the leading providers of airport parking in Sydney, have a bright and friendly manner and love interacting with people. then feel free to send your CV and other details to info@parknfly.com.au. Park & Fly also advertise for airport parking staff from time to time on the recruiting website SEEK. Where can I find Park & Fly's Terms & Conditions? Can I be refunded if I need to cancel? If you purchase a Flexipark for $5.00 (available in the booking process) , you can be refunded up to the day your booking commences. The money will be refunded back on to the card you paid with minus the $5.00. Can I amend the dates on my booking? If you purchase a flexipark for $5.00, you can then email (info@parknfly.com.au) or phone our office on 02 8335 4714 and the staff will be happy to make the amendment for you. Any amendments to reduce the amount of days booked and if it is done prior to the commencement of the booking (as long as you have the Flexipark) we will refund the unused days back on to their credit card you paid with but if you are already checked in and your stay is cut short, we cannot refund unused days as per our Terms & Conditions. You can also amend dates without our flexipark but if the booking is reduced, you will not receive a refund for unused days as per our Terms & Conditions. Can you redeem or accrue points when using a special offer promo code? No, you cannot accrue or redeem points if you are using a special offer promo code. I have a new car and would like to change my rego on my profile, how do I do this? You can only change your rego when making a booking. The system will retain your last registration and it can be overridden when needed during the booking process. Can I make a booking for somebody else under my profile? You can book somebody else in under your profile, you just override your information with theirs and then override it back when you make your next booking. Is your undercover carpark secure? We have CCTV cameras throughout the carpark and our facility is securely locked and manned by onsite security after hours. Is your outdoor self park area secure? Our self park outdoor area has CCTV footage, locked gates at all times and is manned after hours by onsite security. What if my flight gets in after 10pm? If you are arriving on a late flight, you need to call us BEFORE 11PM to request a pick up. Even if our staff need to work past our closing time of 11pm to pick you up, they will do so but they must know before 11pm. What if I am travelling with large items (bikes or surfboards)? If you are travelling with more than one adult, please drop them at the airport with the large items and then drive to Park & Fly and we can drop you back at your terminal. When you are returning back to Sydney, one adult should stay at the airport with the large items and the driver can get our shuttle back to Park & Fly to pick up the vehicle and drive back to the airport. Park & Fly charges for airport parking on a per calendar day basis. The drive-in parking rates are charged if no online booking is made. Pre-book your parking and save up to 30%! Members of Park & Fly's Frequent Parker Program can accrue ​1 point for every $10 spent with Park & Fly. Every point accumulated is worth $1 which can be used for future stays - join now.